Hot Water Beach is NOT a secret! It is known around the world! 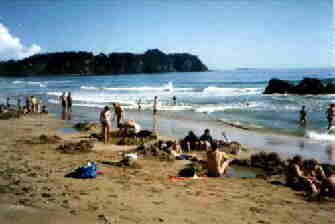 Hot Water Beach is located along New Zealand's Pacific coast just south of Mercury Bay at the northeast tip of the Coromandel Peninsula (map). © Whitianga Focus — used by permission. Hot Water Beach — a playground for all ages! Some volcanos develop huge underground reservoirs of superheated water. Over time, this water will escape to the surface — cooling on the way. There are two fissures at Hot Water Beach issuing water as hot as 64ºC (147ºF) at a rate as high as 15 litres/minute. This water contains large amounts of salt (NOT salt water), calcium, magnesium, potassium, fluorine, bromine and silica. There are other hot water springs nearby but the location of these two springs on the beach make them unique. The short answer is: ONE hour either side of low tide (okay, up to two hours but only if the low tide is REALLY low). Plan to arrive BEFORE low tide to (a) stake-out a place for digging your 'spa' (Hot Water Beach DOES get crowded) and (b) allow for some relaxation in your 'spa' before the tide rises and reclaims the beach, 'spas' and all. A table of low tides	is displayed to the right. The low tide table starts TODAY (as defined on our server) and provides two weeks of low tides so you can plan your visit to Hot Water Beach. If you're not interested in the next two weeks, update the day, month and year and you'll see the low tides from that date -- within the range from 1 Aug 2007 to 31 Dec 2020. 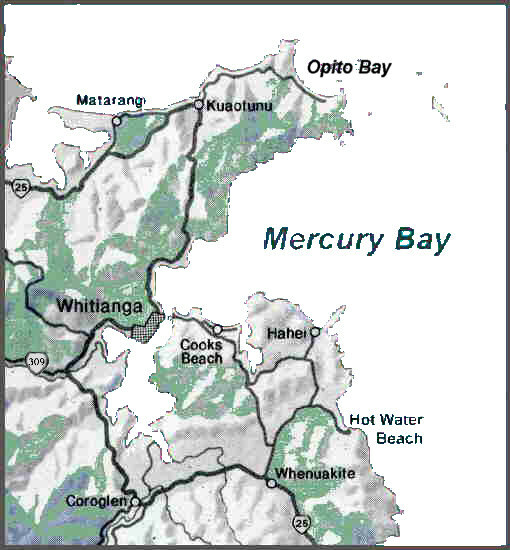 Now you can plan your visit to Mercury Bay -- and Hot Water Beach! Access -- plan on walking through the small stream which separates the car park from the 100 m of beach you need to cross (sorry, there is NO mobility impaired access). Towels and sunscreen are necessary in the summer. Camera! If you arrive in our winter, it will be cool but the water can be HOT! Despite Kiwis' love of their dogs, please plan on NOT bringing your dog here. They are not prohibited but dogs MUST be on a lead and you'll have to "police" any mess. If you're planning on staying at Hot Water Beach, be advised that there is NO camping on the beach. However, there is ... Auntie Dawns Place! WARNING: Despite the volunteer lifeguards (only at the height of the season), Hot Water Beach's rip tides have claimed many unwary visitors. Know how to swim in rip tides before you venture into the ocean! Beware of the rip tides common to Hot Water Beach! If you feel yourself being taken from the shore by a current, DO NOT try to swim back to the shore - you will NOT succeed! Swim parallel to the beach until the current subsides THEN swim back to shore. Hot Water Beach has seen many drownings for the failure of visitors to heed these simple precautions and we don't want to lose any more! There's only one way. Take State Highway 25 to Whenuakite where the only notable junction is the road to Hot Water Beach, Cook's Beach and Hahei/Cathedral Cove. Stay on the main road until you see the (right) turn to Hot Water Beach (~8 km). Please pay attention to the speed limit on this road as it gives a good indication of the road condition -- which is paved right up to the car park. Of course, NO visit to New Zealand would be complete without sitting on the beach in your own private hot pool at the world renowned Hot Water Beach! How much does it co$t? Hot Water Beach is FREE!